Achieving operational efficiencies is essential, but differentiating your customer experience requires a holistic view of contact center performance. Then you can improve customer satisfaction and deliver measurable business benefits. The end result is increased revenue, reduced costs, and a customer centric culture. A dedicated Voice of the Customer solution built for purpose around the contact center, enabling rapid response to customer concerns while informing management decisions at a strategic level. 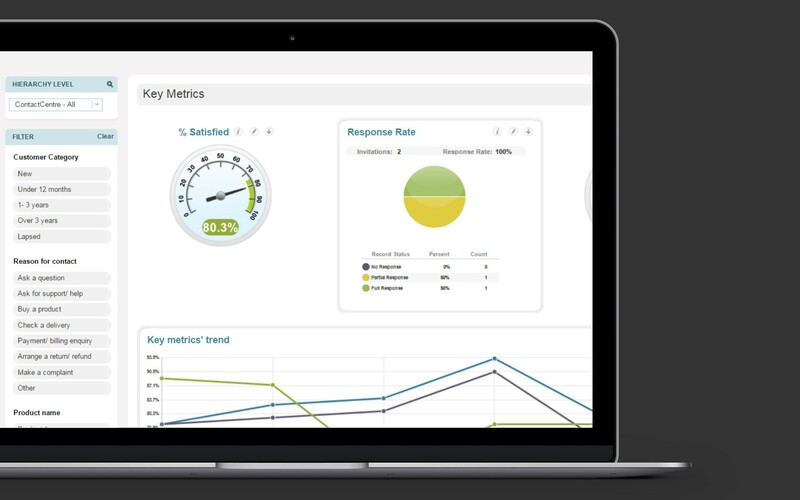 View Voice of the Customer metrics alongside traditional contact center operational metrics. Based upon the learnings of 20 years’ experience, FastTrack combines the best practices we’ve gleaned over the years with the ability to have you up and running very quickly. Real-time dashboards will provide a clear view into the health of your contact center and highlight areas where you can improve. Real-time, role-based reporting, provides managers with strategic-level insights for process improvement and opportunities to guide agent development. Quickly resolve customer problems before they escalate. Immediate alerts notify the right people about issues, such as dissatisfied customers, overdue issues, opportunity for product cross-sell, and potential customer churn. FastTrack for Contact Centers provides the elements you need to get started with your VoC program, and we’ll ensure your program continues delivering maximum Return on Investment. Importantly, the solution ensures long term value by allowing you to expand your program as your needs evolve.